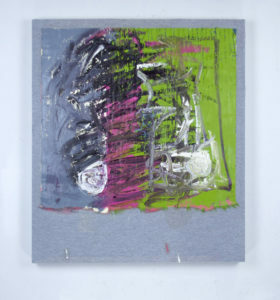 James Harris Gallery | Patrick Driscoll, "Intention and Accident"
Patrick Driscoll, "Intention and Accident"
James Harris Gallery is pleased to present our second solo exhibition by Patrick Driscoll. 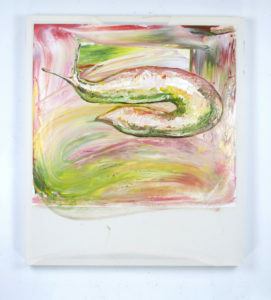 The artist continues to explore the relationship between pictorial and non-pictorial imagery. 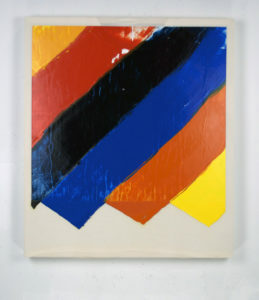 Driscoll’s painting practice can be seen as a combination “New Image Painting” and “Bad Paintings;” two terms defined in the late 1970s. 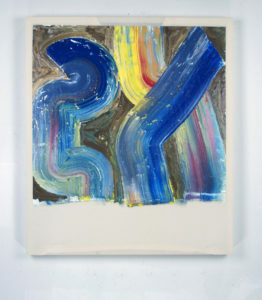 “New Image Painting” relates to the work of certain painters who employ a strident figurative style, often with cartoon-like imagery and abrasive handling owing something to Neo-Expressionism, whereas “Bad Painting” accommodates figuration and abstraction often within the same work. 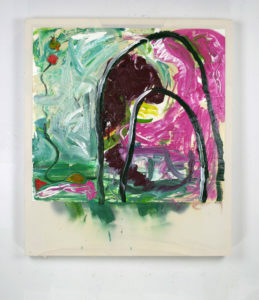 At the core of Driscoll’s practice is an investigation of the conventions of painting, expanding its vocabulary while collapsing the hierarchy of the medium itself. His referential subjects range from animals to cartoon like figures and food, with inspiration drawn from art history, literature, and self-doubt. 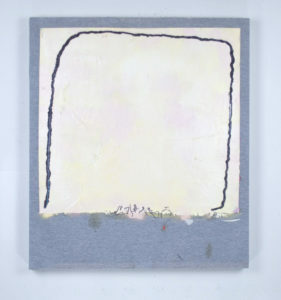 Driscoll continues to use non-traditional materials as the support structure for his paintings. 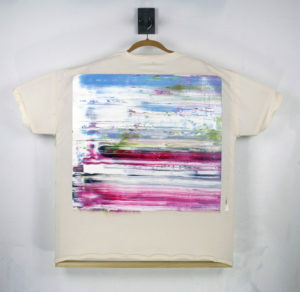 In the past, the artist painted on sections of drop cloths; they were displayed either stacked on the floor or stapled to the wall. 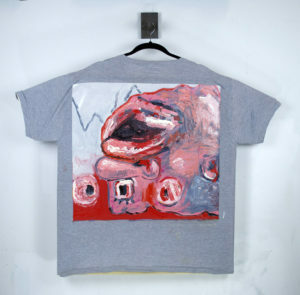 He now paints on T-shirts and underwear, connecting his process to body and persona. 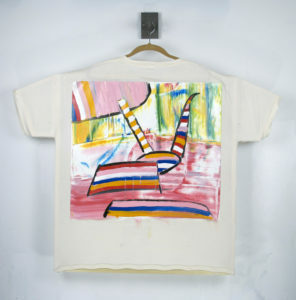 He further subverts the traditional modes of display by integrating coat hangers and wall fixtures with stretcher bars. 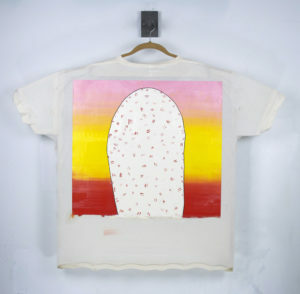 Driscoll begins each painting by stapling T-shirts to the wall and masking off a rectangle. 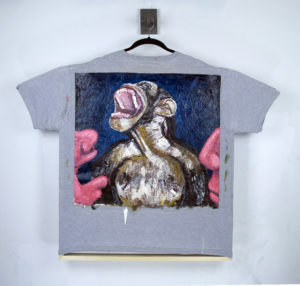 As he works on the painting surface, excess paint from his brush is wiped onto underwear that is also tacked to the wall. 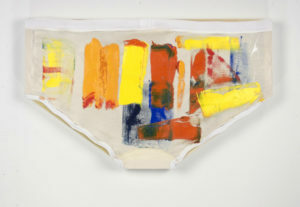 The brush marks on the underwear act as a visual record of the building of a finished work. 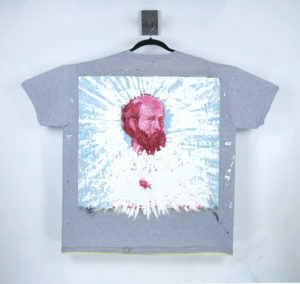 Patrick Driscoll is a painter living and working in Portland, Oregon. 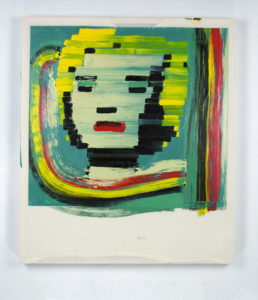 Born in 1984 in Marquette, Michigan, he received his BFA in painting from Indiana University’s Herron School of Art and Design in 2008. 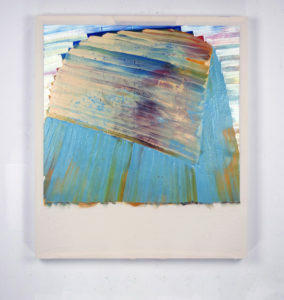 In 2012, he received his MFA in Visual Studies from the Pacific Northwest College of Art, where he was nominated for the Joan Mitchell Foundation MFA grant program for painters and sculptors. He was recently nominated for the Alice C. Cole ’42 Fellowship, and has shown throughout the Pacific Northwest and Midwest. 45 1/2" x 43 1/4" x 1 1/2"
31" x 27" x 1 3/4"
14 1/4" x 23 1/2" x 1 1/2"